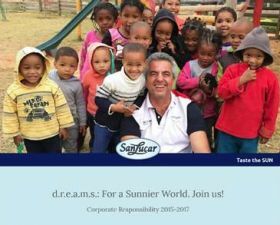 SanLucar will unveil the latest issue of its corporate responsibility report at Fruit Logistica in Berlin. The report, entitled “d.r e.a.m.s. For a sunnier world. Join us!”, sets out the company’s achievements in the field of social and environmental responsibility over the past three years. Between 2015 and 2017, SanLucar invested more than €2.5m in social and environmental projects in Spain, Germany, Austria, Tunisia, South Africa and Ecuador, where it is active commercially. “Our corporate philosophy of taste in harmony with man and nature guides all our actions,” said Stephan Rötzer, owner and founder of the SanLucar Group. The social component of the programme is made up of three areas: education, nutrition and sports, while the environmental aspect focuses on the protection of the air, water and soil. It includes such schemes as the School of Sports d.r.e.a.m.s. in the Ecuadorean municipality of Puebloviejo, not far from one of the company’s farms, where a wide range of sports activities are offered for free to the children of the region. In Valencia, the enterprise has set up the soup kitchen El Puchero. Since 2013 until last summer, 160,000 free meals have been served to help families at risk of social exclusion. SanLucar promotes healthy nutrition in the regions of its subsidiaries. For instance in Ettlingen, Germany, 1,100 pupils received fruit free of charge throughout the entire school year. With regards to education, 2,389 employees worldwide have benefited from wide-ranging training and educational opportunities at the SanLucar Academy in the past two years, the company said. Environmental projects include the establishment of a new irrigation system in South Africa to optimise water consumption in cultivation and the launch of a reforestation programme in Ecuador to prevent the erosion of riverbanks and create a natural ecosystem. SanLucar has been a member of the United Nations Global Compact since 2011. Since then the company has received certifications such as SA8000 in Spain, while in countries like Tunisia, it has been the first to comply with the requirements of the GRASP evaluation certificate that recognises good social practices within the agricultural sector. “We always try to provide concrete and individual help,” said Stephan Rötzer, “Usually it is the small things that help people to improve their situation in the long term and sustainably.